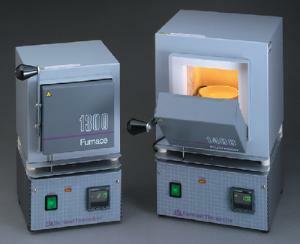 Compact muffle furnace with max. temperature of 1100°C. Digital control provides reliable and accurate temperature control. Easy to use; simply turn set point button and furnace will automatically heat to selected temperature. Welded steel case, efficient insulation and heating elements embedded in special refactory cement for longevity. Insulated door has latching handle to open and close easily. Door safety switch removes power to heating elements when door is opened. With sensor break protection for safety. Panel includes cycle light, on-off switch and digital readout. Dimensions: 4"W x 3.8"H x 5"D (chamber); 9"W x 14"H x 13"D(exterior). With three wire cord and plug. Power: 120V, 50/60Hz, 8.8 A, 1050 W. UL listed. Shipping weight: 20 lbs.